The timing of this week’s podcast was intentional. Well, ok, not originally. I recorded this interview back in December, but saved it, not knowing why. Once I recorded the last podcast interview with Rebekah Greer, I knew why . If you haven’t listened to Rebekah’s story of her husband’s infidelity, their attempted reconciliation and years of being a single mom to 5 young children, then I’d strongly suggest you head on over to listen (click here). In that episode you will hear how Rebekah survived the challenges she faced through discipleship. Having a woman from her church pray over her, lead her, teach her Scripture, gave Rebekah the tools to know God and allow Him to be her strength. This week we will appropriately discuss the topic of discipleship. 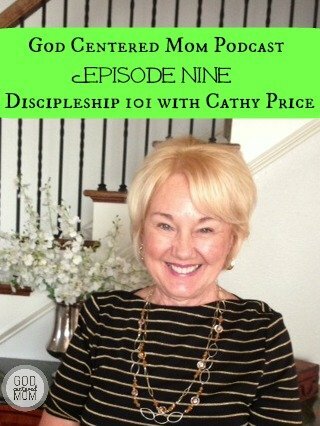 We will answer “what”, “who”, “how”, and “why” of discipleship through this interview with none other than…my mom, Cathy Price! As I mention in the podcast, I vividly remember my mom discipling women around our kitchen table and throughout the week. She was passionate about helping other women know God and train them in becoming like Christ. She also discipled us…teaching us doctrine, discussing God’s word and modeling prayer. If Rebekah’s story last week captured your attention and opened your eyes to discipleship, I hope you find encouragement and motivation to find someone to disciple you or you make a way to disciple another woman (or 2-3!). I also wanted to highlight another website that is doing a super duper awesome thing. My friends Angi Pratt & Laura Krokos at Missional Women are launching Discipleship Groups through Facebook. On their site you can enroll to join a 10-week long community. Transcendent God–It means that God is above, other than, and distinct from all he has made – he transcends it all. Paul says that there is “one God and Father of all, who is over all and through all and in all (Ephesians 4:6). Scripture says elsewhere, “For you, O LORD, are the Most High over all the earth; you are exalted far above all gods (Psalms 97:9; cf. 108:5). Take the risk, invite others, let God move hearts, then disciple (Parable of the good soil–Matthew 13:1-23). Basic Doctrine, Study Scripture, How to Pray, Memorize Verses. Help them develop their own testimony…explaining why you seem different. Mission statement–direction for your life combining spiritual gifts and God’s call. Small Group of women – 4 to 5 (my mom never met one-on-one). Always disciple out of love not obligation–find women you are drawn to, who have a willing heart, and who desire to know God in a deeper way. 6 to 18 months. Commit to continue to stay in relationships. They feed life into you, excite your faith, & don’t drain as much as you would think. Who do you ask to disciple you? Is there a woman in your church you admire, who walks closely with the Lord? Approach her and see if you could meet regularly, go through one of the curriculums mentioned (Multiply or Cru). Have you ever been discipled or discipled someone? Here’s a little reminder on how to listen to the podcast (thanks Kat from inspiredtoaction.com for these steps!). 1. Listen on the blog. Click through to GodCenteredMom.com and click the play button at the beginning of this post. 2. Listen on your smartphone, iPad or iPod Touch – There are a lot of great podcasting apps. Apple has a free one (that I mentioned) in the app store, there is also one called Downcast (that Kat uses). It allows you to search for shows, subscribe to them and even speed up the audio. How special to be able to share your mother with everyone! thanks janelle. I feel pretty lucky to be her daughter!